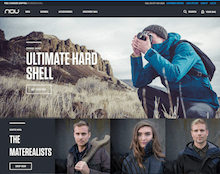 After an exhaustive agency search we landed at Copious to both further the digital brand design and re-platform our ecommerce site on Magento Enterprise. Though I'm typically skeptical of agencies that offer both design and development (I've rarely seen both done well), after meeting Patrick and his crew of UX/UI, design and engineering experts, I changed my mind. From our 2-day workshop to the final switchover to deployment, Copious was engaged, communicative and forthright — not to mention whip smart and pragmatic in their approach. Through sharing ideas, best practices, and experience we together pulled off one of the most elaborate responsive ecommerce sites ever created. In the end, while we will constantly be iterating the site, it will be Copious who has won the right to lead our development in the future. I highly recommend using them for your project. And ask them for the whiskey. The good kind. You'll need it when you celebrate.